At the heart of the CPAAA - a place offering shelter & protection for penjing values..
John Jeffery of Trees in Pots Limited and the Jeffery Lee Wong Foundation. as from the 11th day of June 2008. Mr. Philippe Tot - who is mastered in ' Lingnan Style ' penjing, giving credit also to his tutor Mr. Al Yee Juaco ( a pupil of the late Master Kevin Lei Wu of Tsuen Wan, Hong Kong ). 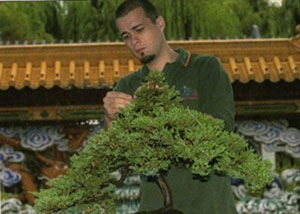 the penjing collection curator & specialist of penjing, at the Chinese Garden of Friendship, Sydney, Australia. The Lingnan Penjing Academy of Australia.